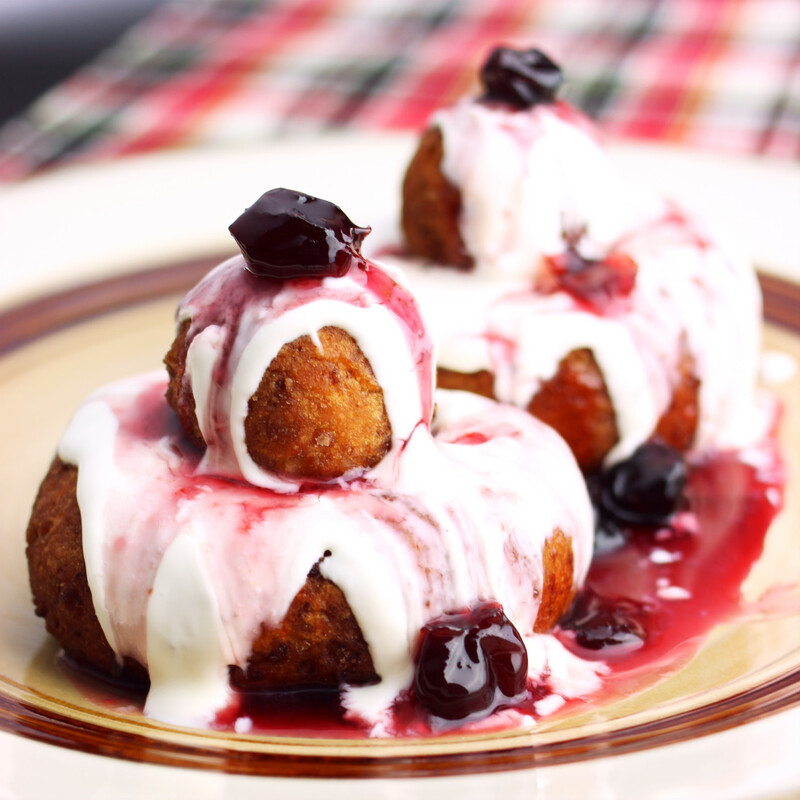 This exquisite Romanian dessert masterfully combines warm flavorful fried cookies with the smoothness of cream and the sweetness of fruit preserves (think of hot brownie and vanilla ice cream taken to the next level). The recipe is quite simple and quick. A small difficulty is in finding the right cheese (I promise to research a few even easier alternatives and report back soon), and a small inconvenience is in discarding all the extra cooking oil - it feels like such a waste! So you'd better invite your friends and have a papanasi party! - Stir the baking soda with the lemon juice. Add the cheese, salt, sugar, cinnamon, vanilla, egg, and lemon peel. Mix until uniform (it's ok if you have small chunks of cheese every here and there). - Slowly add the flour, and mix. You want to end up with a dough that does not stick to the fingers - you might not need all the flour, depending on how wet the cheese you use is. - Now to forming the papanasi. There are two parts: the base, and the top. You create the base by using a bit of dough, rolling it in a line that has the same diameter as a pinkie and the length of about three pinkies, and firmly joining the two ends (same shape as a doughnut). Note that the dough will increase in volume when cooking. - For the top, use about a tablespoon worth of dough, and roll it into a sphere. - The next step is frying. It is best if you have enough oil to cover the papanasi when cooking: so use a taller frying pan, and be generous with the oil. Pre-heat the oil on medium heat - it is ready when you add a bit of dough in the pan and it starts quickly cooking and forming circles around it. Now carefully add bases and tops, rotate and necessary, and remove when they turn golden-brown and look delicious. Don't overcrowd the pan. Place the cooked papanasi on a paper towel (such that it absorbs the extra oil from cooking). You may want to prepare one or two papanasi, cut them, and check the interior - if it's not properly cooked, then reduce the heat to prevent burning the outside while the interior is still cooking. If they're too thin or think, adjust the size/shape of the dough before starting to cook. - You want to serve this quickly, while they're still hot/warm. - Place a base and a round top above it. Generously add crème fraîche and fruit preserve. - Gently sprinkle some powder sugar over the plate for an artistic finish.